Deadhorse Point in Utah is a very popular spot to photograph at sunrise (above) and sunset. I had to change the name from Friday to Weekly Foto Talk ’cause I’m a day late! I’ve been making my way across the desert southwest through the winter’s first real storm. It snowed overnight and the desert was frigid but beautiful this morning! Say you’re going on vacation, perhaps to a national park. Or much more relevant to late November, say you’re going to Hawaii, or the Virgin Islands. Since you’re a serious photographer you’d like to get high quality shots of the place while your’e there. The question comes up: where to go shoot? And when? Should I go to this place or that place at sunrise? Which one should I hit at sunset? Since this is a very broad topic, it will cover two parts, finishing next week with part II. But it’s still much too broad. What to shoot? I’m realistic; I don’t want to go into that rather personal question. So allow me to narrow things down. I got the idea for this post when I read the flier given me by the ranger upon entering Arches National Park in southern Utah. These newspaper-style publications are a feature of most national parks in the U.S. Though they convey useful information on camping, trails and programs, not to mention a decent road map, they can also be tiresome. Repetition of the same park rules you see on countless signs is typical, as are blurbs that incorporate scare tactics. Apparently those who write these things for the federal government believe scare tactics are a good way to inform. In most cases they wish to scare you on two fronts. Firstly, they want you to believe not only that the animals in the park are wild (which might seem obvious to most of us) but that these critters would like nothing better than to claw/bite/trample you and those you love. Also they want you to realize that, despite all those old cartoons featuring characters who survive 2000-foot falls and huge boulders toppling over on them, getting up and walking away with a body shaped temporarily like a spring, the terrain is real and quite unforgiving. The cliffs are precipitous, the rivers swift, and the rocks as hard as..well as rocks. A cottonwood tree along Kane Creek Wash near Moab, Utah was an irresistible attraction. Arches National Park’s flier was mercifully short on these gratuitously written blurbs, and for that I thank their local scribe. There was, however, one feature I found interesting. Arches is a magnet for photographers, and so the Park Service, in their constant spirit of helpfulness, included in their flier a list of suggested locations for photography. There were two lists of recommend places to shoot, one for sunrise and one for sunset. Being a stubborn lot, most serious photographers don’t like advice on where to shoot. But when you’re unfamiliar with a place it is tempting to take this kind of simple advice – where to go and when – and run with it. In traveling around the park, I soon realized that those subjects recommended for sunrise photography (such as Turret Arch) face east, while those that are supposedly good for sunset (such as Delicate Arch) are lighted by the setting sun. 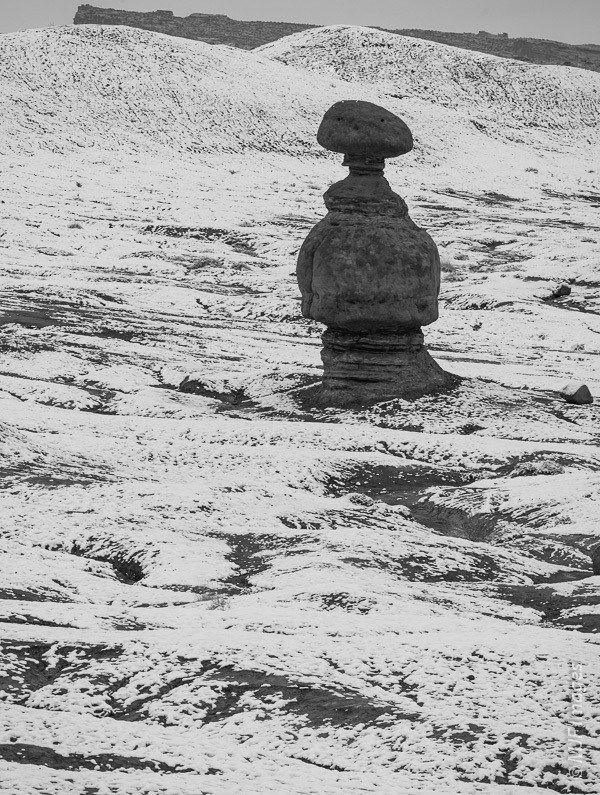 Alone in the snow, a rock formation in the weird Goblin Valley of southern Utah. Obviously the Park Service thinks we should all photograph the Arches’ wonders in front-light only. But they aren’t the only ones. Many similar lists that pop up during web searches are identical in their simplistic assumption of desired lighting. There is an implicit assumption that it’s important to avoid shooting into the sun or even at much of an angle to it. Of course this is silly advice. You do want to shoot into the sun at times. You do want to shoot at an angle to the sun. You do want to throw subjects into silhouette at times, etc. etc. Light snowfall during the day brought something to shoot during an otherwise gray hike in the desert. There are a couple other problems with taking this sort of simplistic advice too much to heart. First, you’ll be shooting, almost by definition, what nearly everyone else is shooting. I’m not saying you won’t get nice shots at popular spots if the light is good, and I don’t completely eschew these over-shot subjects anyway (see top image). But unless you do something different at those locations your shots will be part of a huge group of near-identical pictures. The second problem is more subtle. Traveling around a place like Arches hitting all these recommended spots at the “right” times squelches exploration and creativity. If you want to find your own unique compositions you need to explore on your own with no preconceptions in mind regarding where to go shooting and when. I think you need to do mostly do things in this more challenging way in order to develop your own style. Molly’s Castle near Goblin Valley State Park, Utah. What I suppose I’m saying is that the question of what to shoot and when can be answered by this simple encouragement: go find out. When I say go I mean it in its traditional sense. You’re not “going” to the web or “going” to an article in a magazine, or even “going” to a trusted blog (hehe!). You’re using your motorized conveyance of choice and then your own two feet to go find out. Though I believe in it 100%, the above paragraph still seems to be a bit of a cop-out on my part. So in the second part of this post, I’ll go into more detail. I will pass on some tips on how to get started on the process of finding out what and where to shoot and when. I should mention I already did a blog post on photo trip planning, so it’s not as though I don’t believe in planning ahead. But this post’s next part will dive more into on-the-ground decisions and using recommendations and your planned itinerary wisely, not as a crutch. Tune in next Friday for that (I promise)! 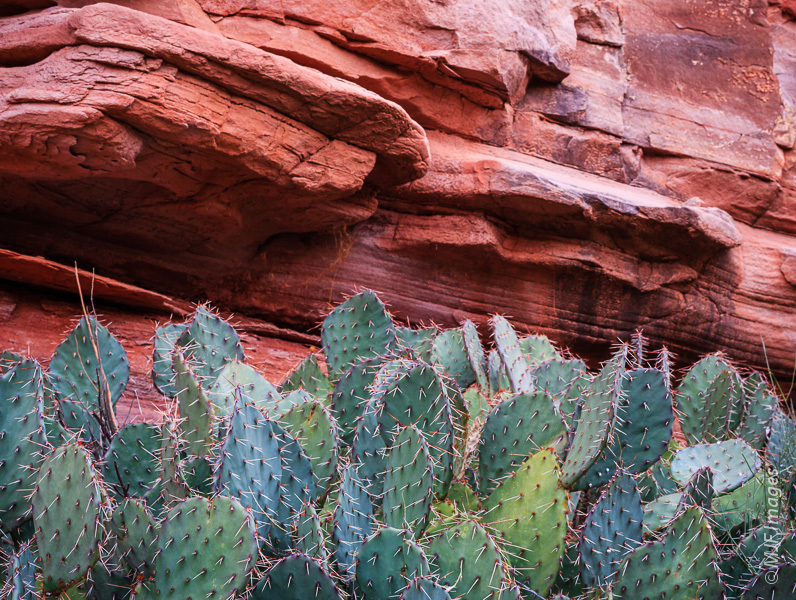 What self-respecting photographer would waste light like this on just a random, unremarkable place out in the desert? This photographer. I love the sharpness of all your photos. They seem so crisp and colorful. That first photo is fantastic – what a view. Somehow I get this crazy idea that the park information was not written for people like you. So my question is did you go to any of the places they listed as photography hot spots? Haha probably not Lyle. Of course I did. I didn’t necessarily visit at the recommended times nor photograph the recommended subjects, but I checked most of them out.